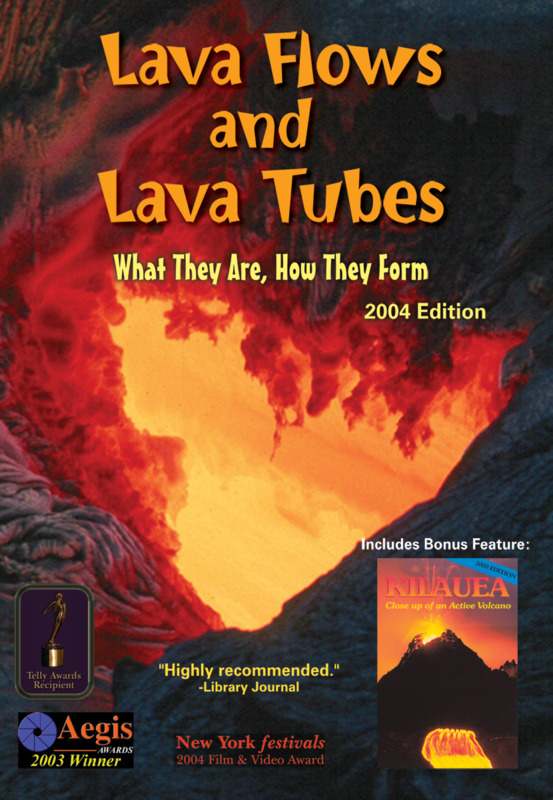 Two Award-winning films on one DVD, amazing close-up lava footage. Chances are, you’ve seen lava before. Maybe not the red flowing stuff, but that black rock that may make badlands, or crown cliffs. Have you ever been to Craters of the Moon, Yellowstone, Hawaii, Lava Beds, Mt. St. Helens, Newberry, El Malpais, Sunset Crater, or Capulin? These and many other places around the U.S. – and the world – have young lava flows. Perhaps you’ve crawled through a lava tube or climbed a big cinder cone, and wondered, how did this get here? That’s what this video is all about. We’ve spent many years studying, filming, and teaching about active lava flows. What we’ve found is that no matter how hard we try to explain in words, the easiest thing to do is to just show people how lava flows work. So we’ve done a lot of filming of specific processes that interest us, and that we’ve wanted to show people. How different types of lava flows move and grow. How a lava tube forms and evolves and eventually becomes a big cave. Why in some places you get cinder cones and not in other places. This video goes through all that and much, much more. We’ve worked hard to create a video that uses stunning visuals to communicate up-to-date scientific ideas about lava flows in language that can be understood by just about everyone (assuming you speak English). It is jam-packed with information and ideas that should really help you understand not only the hot lava you might someday get to see, but the black rock that may be in your own backyard. Excellent for classrooms (from middle school to graduate level volcanology) or just for anyone who loves watching gorgeous lava footage! We think this will be eye-opening even for most geologists. Our updated, award-winning video brings you as close as possible to the volcanic activity at Kilauea. You will come face to face with lava fountains at Pu’u O’o, then follow the flows downslope to the ocean. Along the way, you will see a wide variety of eruptive phenomena and learn how these fascinating features form. This video is the most popular program for use in elementary through secondary schools and universities to show Hawaiian volcanism. It appeals to anyone who is interested in volcanic eruptions and wants to know more about how they form.